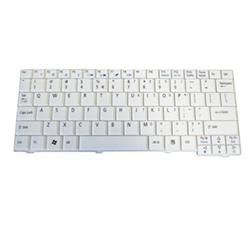 Description: New genuine Acer Aspire One white replacement netbook keyboard. US version. Part #'s: KB.INT00.668, KBINT00668, AEZG5R00120, MP-08B43U4-9203, CNYAEZG5R00120090316. Acer Aspire One A110, A150, ZG5, D150, D250, P531, 531H, KAV10, KAV60.